Pam Curnel, along with her husband, Dr. David Curnel, has been the Mrs. Washington America State Director/Producer for over 25 years! Pamela has over 45 years experience mentoring young girls and women in all phases of pageantry. In addition to being the pageant's Choreographer/Dance Instructor, Pamela also enjoys designing costumes for Mrs. Washington to take to Mrs. America for the parade of states. She has designed two state costumes that won the national costume award. She designed a costume that represented the state flower, the rhododendron, for Deidra Murphy, Mrs. Washington 2017. She also designed a costume that represented the City of Seattle, which won the National Costume Award with a $1,000.00 cash prize going to Erin Ring, Mrs. Washington 2004. The MRS. WASHINGTON AMERICA Pageant is a prestigious televised pageant for married women of all ages and is also the state preliminary to the Mrs. America & Mrs. World competitions. Our mission is to empower and mentor women to “Make a Difference” in their communities. You will experience a year filled with free workshops, community service, appearances, parades, fun filled events and parties, and you will meet new friends and create memories that you will cherish for a lifetime! Even if you do not come away with the crown, you will experience your own WIN with all of the personal growth and development that you achieve, as well as knowing that you are becoming the very best version of yourself, the woman that you have always wanted to be! 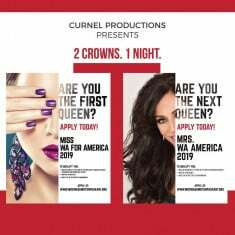 The Pageant will be held June 15, 2019, 7:00 PM at the Kenneth Minnaert Theater for the Arts in Olympia, Washington.